Being a breast cancer survivor, I do double duty during the month of October. First, let me pay homage to the pink. You can’t miss it ~ the ribbons, the billboards and the pink lights that bathe the city from the John Hancock building and Trump Towers just to name a few of the 136 current and past lighting participants during October. 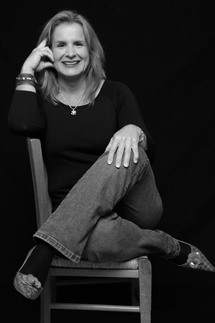 Now the double duty part ~ I’m also the Executive Director of Between Friends, a domestic violence agency in Chicago. So every October I go in search of those elusive purple ribbons, the billboards proclaiming that every family deserves a safe home, and the buildings that bathe the city in purple lights. 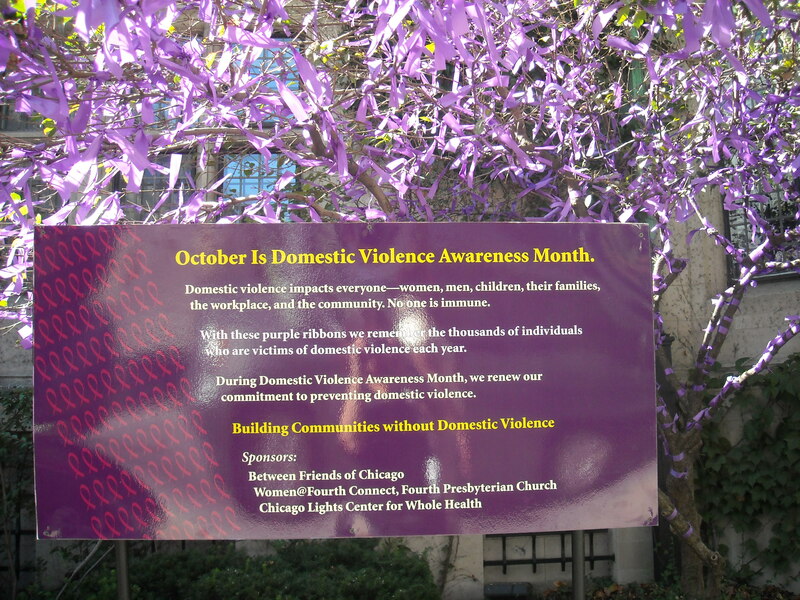 Well, I see little of that but I do notice a few trees on Michigan Avenue proudly wearing purple, the color of National Domestic Violence Awareness month. I must confess that next year I’d like to see just one building in Chicago shine purple. Fourth Presbyterian Church is a sanctuary ~ “A Light in the City” ~ surrounded by the John Hancock building, Water Tower Place, and the Drake Hotel at the threshold of Chicago’s infamous Magnificent Mile. 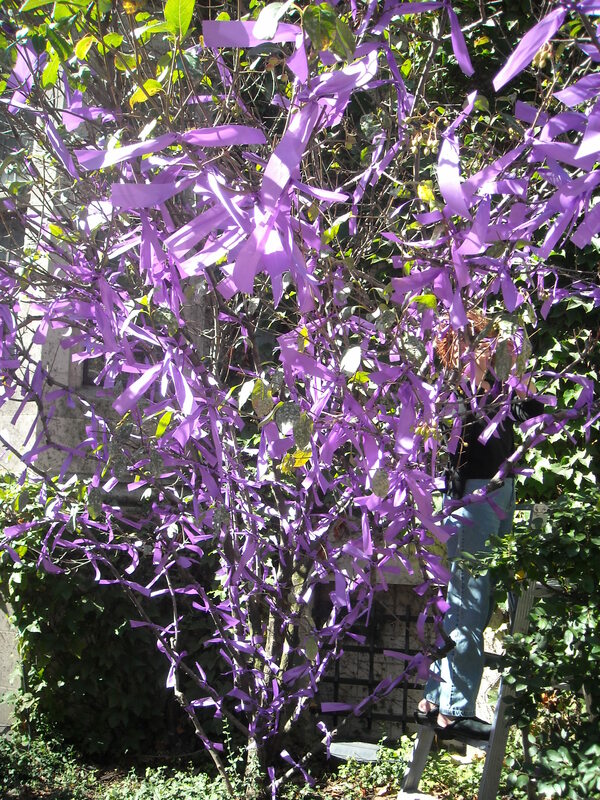 This year the purple ribbons gracing their trees make a very visible statement to residents and tourists. Terrill L. Stumpf, Director of the Chicago Lights Center for Whole Health at 4th Pres, is on the Between Friends Advisory board. Women@Fourth Connect and Between Friends sponsored the purple ribbon tying event. Oak Street beach is the gateway to Chicago’s Magnificent Mile. 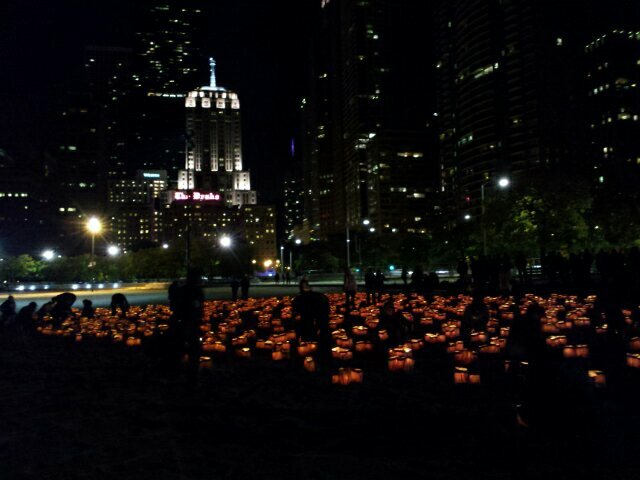 On October 1, Between Friends lit thousands of candles in the sand in honor of individuals affected by domestic violence. It’s clear to me that this country needs more purple. On October 5th, Between Friends hosted a reception to open the Survivor Art exhibit at the Chicago Public Library’s Budlong Woods branch. The exhibit’s co-sponsors are Apna Ghar, Korean American Women in Need, and Heartland Alliance. Almost six years ago, I was diagnosed with breast cancer. My partner threw me a “Good-Bye Boobie” party. . .
Every year at this time, I ask myself, “Why do we celebrate breast cancer survivors but shame survivors of domestic violence? We ask these women “Why do you stay?” instead of “Why is he abusive?” We never blame women for the lump in their breast. We support them with “Good-Bye Boobie” parties and most importantly, we look for a cure. So it’s clear to me that this country needs more purple. She told me I would never escape the label of a battered woman. She told me I was damned to be forever served up on the talk shows and identified in all my work as the woman who was abused by her husband. No matter what I did, this took precedence. No one would ever take me seriously or give me a reporting or writing assignment that was unrelated to the abuse; and the market for victim journalists was small. We hung up that afternoon and never spoke again. I needed support, not criticism. I wrote the book in stolen moments over the next three years, beginning when my sons were six, four and one. Now, 12 years after the publication of I Closed My Eyes (Hazelden, 1999), a book reprinted in seven languages, and selling many, many tens of thousands of copies, I have published a million more words since in other books, newspapers, magazines, websites and keynotes. But my memoir remains my single greatest personal and professional accomplishment. . .
It’s true that no woman wants to have “victim” on her name tag for the rest of her life. But more than that, no woman wants it on her headstone. I have spent every waking hour this October writing stories that celebrate survivors because I knew at my core that if we are to have peace at home, survivors will be the ones who will make it happen. 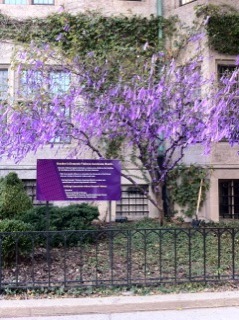 It is up to us to make sure people wear purple and know that October is National Domestic Violence Awareness Month too. I wasn’t safe in Chicago. The judge knew all my haunts and friends. Of all the things that I miss about Chicago, I miss 4th Pres and John Buchanan’s sermons the most. I miss my walks along the lake and the Oak Street beach with the Drake Hotel in the background. So, I was exceedingly touched to see all those purple ribbons and the luminaria. The survivor art exhibit and a call for everyone to wear purple are ideas too cool for words. My friend Kiwi Mary in New Zealand has asked her staff to wear purple on Friday. I can’t wait to see their photos posted on Between Friends’ web page along with all of your photos wearing purple and a smile. Hi, I am visiting Chicago for a meeting. I was so impressed to see the church and purple ribbons. 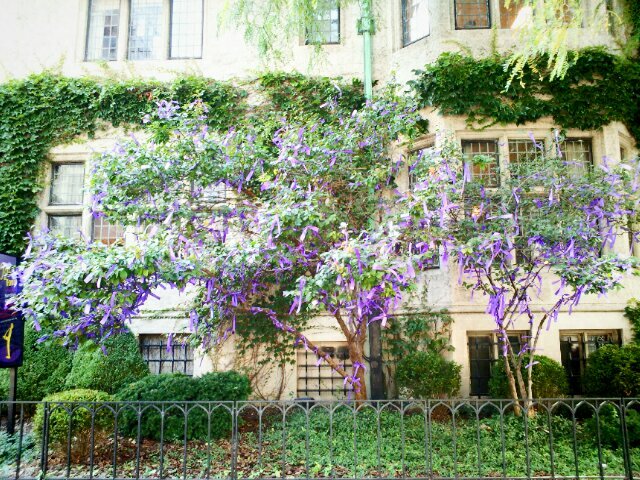 When I got back to my room tonight, I found your blog post so I can learn more about the purple ribbons. I will wear purple, too. Thanks for visiting and leaving your comment. Hope you are having a great time in Chicago. Thanks for bringing back wonderful memories of 4th Pres and for wearing purple.